Split ends are a girl’s worst nightmare, especially if you’re trying to grow your hair out. This constant hair foe may be a formidable enemy, but there are lots of recourses you can take (including, yes – regular hair cuts!) to stay in control, and constantly have healthier looking strands. Never tie your wet hair up in a tight ponytail or bun. Your hair is at its weakest state when it is wet and it will break easily if too much pressure is applied. This is hard to do in the summer months when it is hot and sticky, so try a loose jaw clip to ease the tension on the hair, says Jill Marcordes, Executive Director of Cosmetology & Nail Technology at Tricoci University of Beauty Culture. Another styling no-no is thermal styling without heat protection! It is so important that we protect the hair fiber from extreme amounts of heat. There is no permanent fix to a split end other than a hair cut, so protect your hair from the beginning to avoid them, says Marcordes. It will help the hair look smoother and cause less flyaways when you have split ends, says celebrity hair stylist Eva Scrivo. Let the hair air dry as long as possible and apply a product like Kerastase Resistance Fibre Architecte Serum to help bond the ends together, dry with a round brush and allow the hair to cool on the bristles for 10 seconds for a shiner result. MORE: Ask an Expert: How Often Should I Be Cutting My Hair? It is important to eat healthy; feeding your body with nutrients will allow your hair to grow strong and healthy. Celebrity Hair Extension Expert Angelo David Pisacreta of Angelo David Salon in New York City also recommends an all-natural hair supplement, such as Hair Detox. Unhealthy hair causes split ends and breakage and can come from a variety of reasons such as stress, environment, excessive heat, or over processed color. 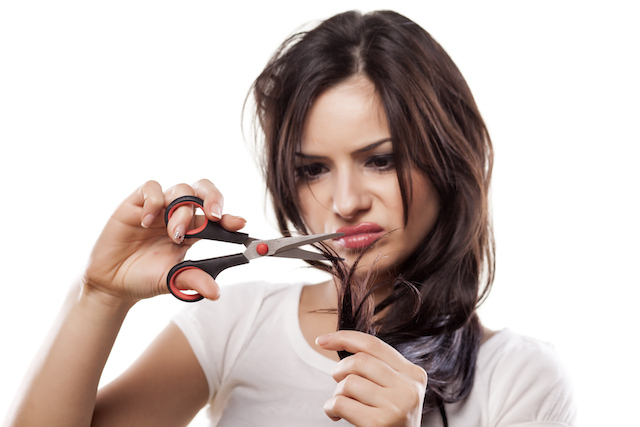 Ultimately, the best way to avoid split ends is to get regular hair cuts. For fine hair a haircut is a must every 6-8 weeks (this texture is more fragile, hence why more frequent cuts are a must), says Jasmine Anna Galazka, a hair stylist at Oscar Blandi Salon. For medium textured hair that is non-color treated, you can probably get away cutting it every 8-12 weeks. For coarse, curly hair, which is naturally dry you would have to pop into the salon every 8 weeks.